A proven way to increase hair growth. An effective device fighting hair loss without causing side effects. An innovative technology based on the low level laser beam action. ViviComb is an innovative laser comb whose design is based on the revolutionary LLLT technology. Its primary purpose is to prevent hair loss and stimulate hair follicles to grow. Thus, the machine works comprehensively, both as a suppressant as well as an activator of particular cells of the skin on the head. What distinguishes this revolutionary laser comb is its unique effectiveness and safety. Studies have shown that over 90% of people using ViviComb reported marked improvement in the condition of their hair, which has become thicker and its number has grown significantly. Based on the results of numerous studies conducted on people suffering from hair loss, it has been proven that balding negatively affects their mood and psyche. Hair loss looms large in our minds and often causes apathy or nervousness. This is unhealthy both for us and people around us. It is important to realize that this problem can be successfully solved. People suffering from excessive hair loss can now see light at the end of the tunnel. ViviComb revolutionized the hair care products market, making the problem of baldness a choice rather than the inevitable reality. ViviComb has been approved by FDA as a device effectively inhibiting hair loss. 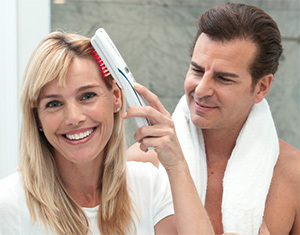 In addition, the use of this innovative laser comb has shown no side effects. This means that ViviComb is 100% safe for your skin!